Every day new smartphones get introduced in the market with advanced technologies and flagship specifications. So, it’s very difficult for the customers to select one gadget from an ample number of smartphones. Most people consider on stylish looks, premium build, performance, camera when planning to purchase a premium flagship smartphone. 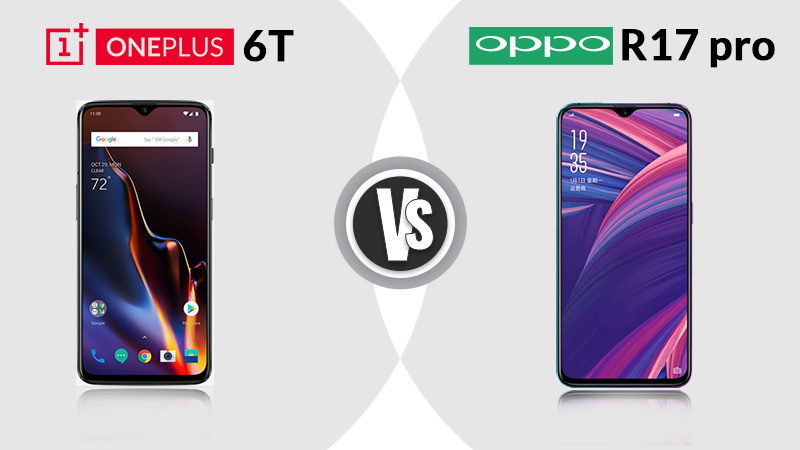 Oppo R17 Pro and OnePlus 6T have been recently introduced in the Indian market with top of the line specifications nearly at the same amount of money. So, both OnePlus and Oppo, the Chinese smartphone manufacturer companies are competitors of each other, as it offers mostly the same set of specifications. Oppo, the Chinese tech giant has launched its premium mid-range segment Oppo R17 Pro in India on December 4, while the OnePlus has launched its OnePlus 6T on October 30 in the Indian market. In India, OnePlus 6T is available in three storage variants 6GB RAM/ 128GB storage, 8GB RAM/128GB storage and 8GB RAM/256GB storage that has been priced at Rs 37,999 Rs 41,999 and Rs 45,999 respectively. On another hand, the Oppo R17 Pro comes with a price tag of Rs 45,990 for single 8GB RAM and 128GB storage, while the OnePlus 6T costs Rs 41,999 for 8GB RAM/ 128GB storage. 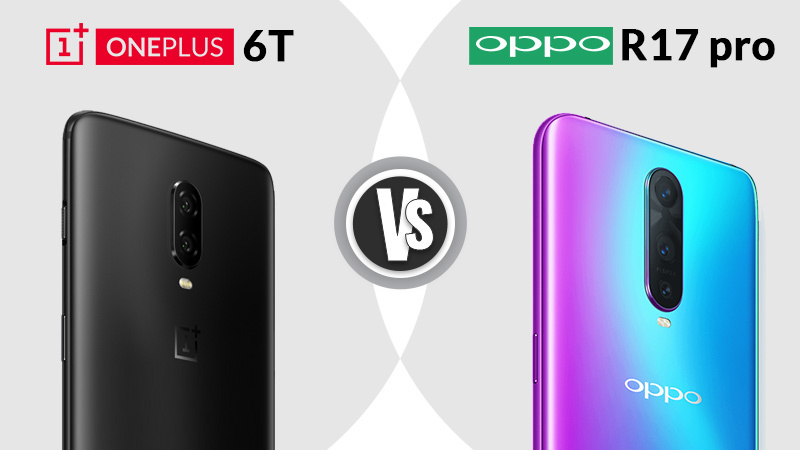 Shortly, OnePlus has offered more than one variant in OnePlus 6T, while Oppo has launched only one variant of Oppo R17 Pro which is a major drawback for the company. When we are talking about the display of the Oppo R17 Pro and OnePlus 6T shares most of the specifications to each other. Both, Oppo R17 Pro and OnePlus 6T have a 6.4-inch full-HD+ AMOLED display panel along with a 19.5:9 aspect ratio. On the top, both of the devices feature a water drop- shaped notch houses front camera and sensors. Both of the phones are being protected with Corning Gorilla Glass 6 which secure the device from scratches and damages. 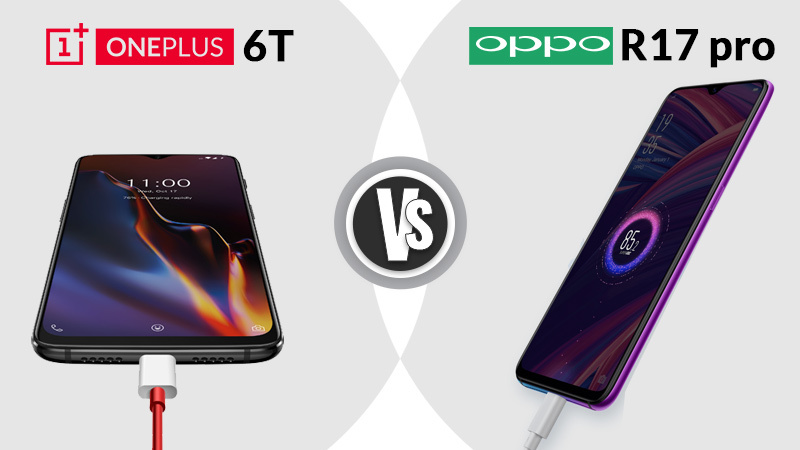 The Oppo R17 Pro and OnePlus 6T are identical to each other in terms of design. Both of the devices come with a metallic and glass unibody design and look similar from all sides. There are some minor differences, the SIM tray is positioned on the bottom of the Oppo R17 Pro as well as an alert slider is missing on it. Additionally, the Oppo R17 Pro comes in impressive color i.e., radiant mist with an attractive combination of violet and blue. 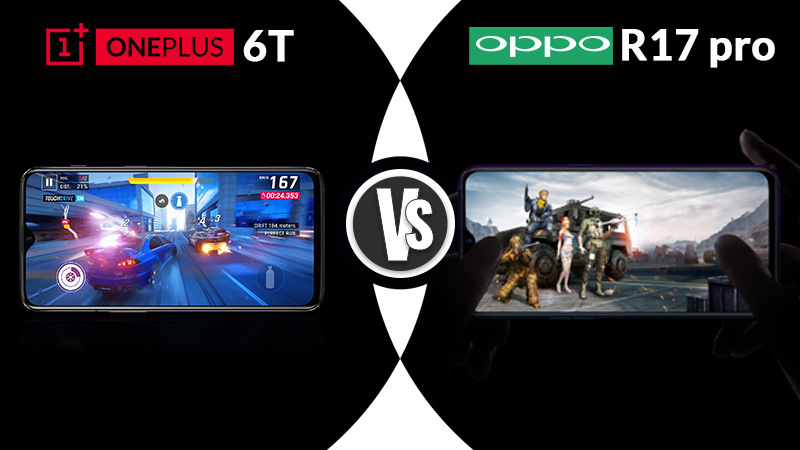 It is one of the positive points for Oppo which gives it a significant edge over the competitors. 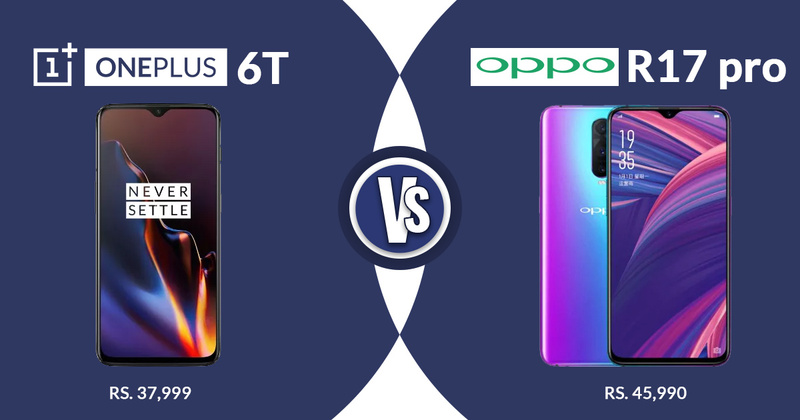 Shortly as such, there is no difference between Oppo R17 Pro and OnePlus 6T in terms of design and display. The Oppo R17 Pro comes with a triple lens on the rear side while the OnePlus 6T has dual sensors on the rear side. The triple lens on the rear side of Oppo R17 Pro helps the company to edge over the competitors. The Oppo R17 Pro packs a 12MP primary sensor, a 20MP secondary sensor and a TOF 3D sensor. The TOF 3D sensor can be used to click 3D information. The disappointing part is that the 3D sensor can’t be utilized independently, so it’s difficult to say for which purpose it can be used. On another hand, the OnePlus 6T gets dual sensors on the rear panel consisting of a 16MP primary sensor and a 20MP secondary sensor. The Oppo R17 Pro rear camera set up comes with a dual-aperture primary sensor which can be adjusted in between f/2.4 and f/1.5 depends on the lighting environment. A 20 MP secondary sensor retains same on the OnePlus 6T and Oppo R17 Pro. For selfies and video calling, the Oppo R17 Pro has a 25MP ultra-wide camera while the OnePlus 6T gets a 16MP sensor. When we are talking about the performance, OnePlus 6T is powered by the modern Qualcomm Snapdragon 845 SoC, which is much better than the Qualcomm Snapdragon 710 chipset available in the Oppo R17 Pro. The Oppo R17 Pro comes with Android Oreo-based on the ColorOS. Here, OnePlus is one step ahead than the Oppo, as OnePlus 6T runs on top of the line Android 9 Pie layered with the highly praised OxygenOS. Notably, OnePlus has been famous for rendering regular software updates and new features in its flagship smartphones, while Oppo is significantly lower in this case. Both OnePlus 6T and Oppo R17 Pro are powered by a 3,700mAh battery. Both of the devices come with the support of fast charging technology, while Oppo takes a significant advantage by offering Super VOOC technology. During the tests, the Oppo R17 Pro takes only 40 minutes to get charge the device full, claims company. Both, Oppo R17 Pro and OnePlus 6T come with under- display fingerprint scanner to unlock the device. The accuracy and speed of both devices are good enough. Now moving to the buying decision which is one of the most important factors to purchase a new smartphone. It totally depends on what is your most preferred choice when you are going to purchase a premium mid-range segment smartphone. If you are focusing on the performance and software then the OnePlus 6T is the best option for you. If you are considering the camera specifications or super fast charging then the Oppo R17 Pro is a good choice. At last price factor also does matter as both the devices comes a bit expensive than other mid-range smartphones. Poonam Hotwani was born and brought up in Kota (Rajasthan) and currently she is living in Jaipur to make her future and career bright. Being a management graduate, she loves to write on topics such as finance and latest launched smartphones. Currently, she had joined SAG Infotech Pvt. Ltd as a full-time content writer. She had completed her professional qualifications such as MBA and BBA in Human Resource Management and Marketing. Now she is ready to showcase her talent and skills in front of media. Her keen interest areas are exploring websites, reading, writing, cooking and internet surfing.